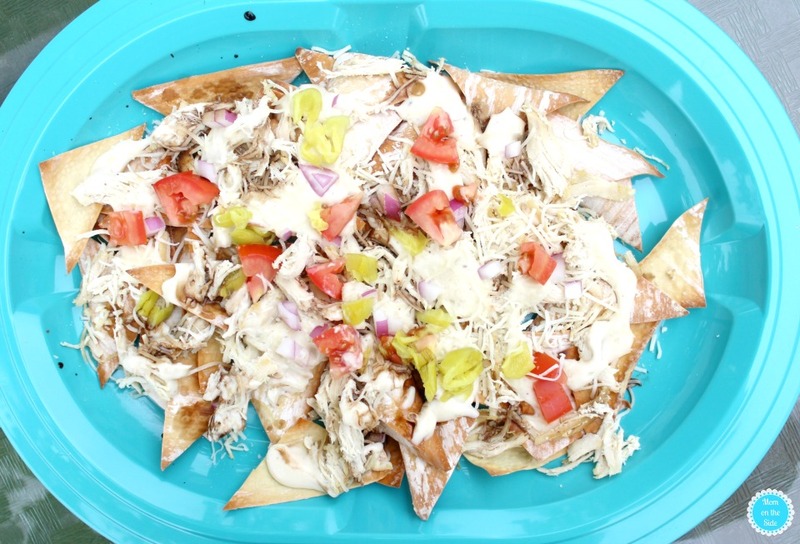 Ever since I returned from all the adventures in Branson, Missouri (you can read about them on MidwestMomLife.com) I’ve been craving Nachos Italiano from Florentina’s Ristorante Italiano. OMG are they delicious and if they delivered I’d be broke. It’s a 6.5-hour drive to Branson for me so the second best thing I could do was create Italian Nachos Inspired by Florentina’s. 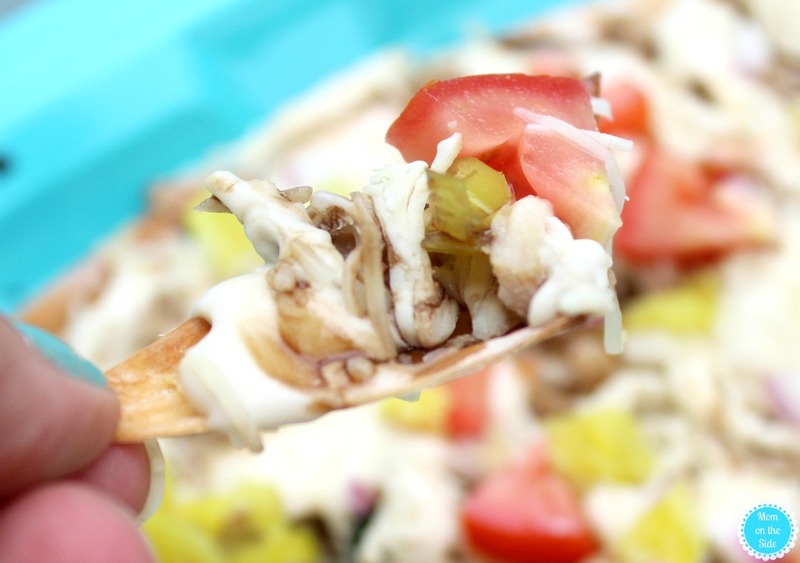 The crispy cheesy goodness with a touch of sweet and spicy has forever changed nachos for me. I’ve made them twice in the last week. On Mother’s Day, I made extra to avoid any fights between my mother and brother. While they aren’t as good as Florentina’s they are yummy in their own right. Plus, super easy to whip up and the chips will shock you. They are baked wonton wrappers! First, dice up the cherry tomatoes, red onions, and peperoncino. Next, cut the wonton wrappers into four triangles and bake them on a cookie sheet at 350 for 5 minutes. For the chicken, I had pre-shredded chicken the fridge that I heated up on the stove, but you could also cook the chicken before the wonton wrappers and shred it. While the wonton wrappers are baking and the chicken is heating, start heating the alfredo sauce in microwave or stove. Once the wonton wrappers are done layer them on a serving plate. Top them with shredded chicken, alfredo sauce, shredded cheese, and the diced veggies. Cover with foil for a few minutes so everything can get happy and melty together before you devour them. 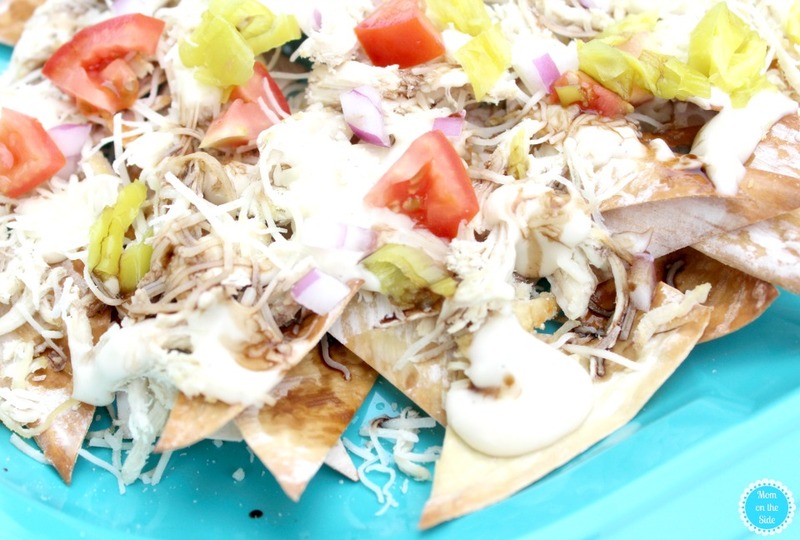 I hope you enjoy these Italian Nachos as much as we did! You can learn more about our visit to Florentina’s HERE.